Online photo submission is a pretty straightforward process, and the parameters for an acceptable photo are fairly consistent across the board. But as one student in the UK has proven, drunkenly applying for an ISIC card and taking a photo with a Snapchat filter can yield some interesting results. According to a report from The Independent, Daire Shaw, a 19-year-old law student at Liverpool’s John Moores University, posted on Facebook that he drunkenly applied for his National Union of Students (NUS) card and that he had uploaded a strange photo to be printed on the ID. The student’s post has since received more than 13,000 likes and seen more than 3,000 comments. 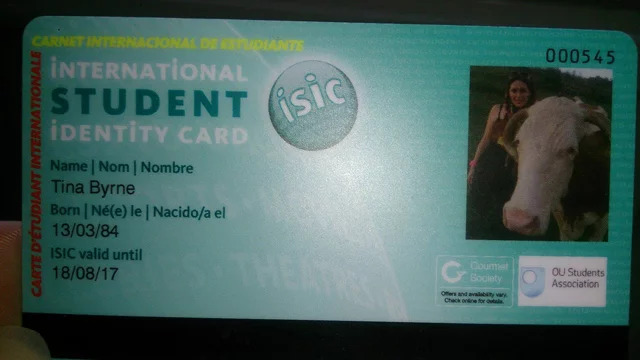 ISIC cards require a cardholder photo and allows the cardholder to select the photo to be used. This process is typically a seamless one, but in Shaw’s case the chosen photo was one with taken with a Snapchat filter that gave the student a warped head shape and bug eyes. Shaw, a Belfast native, arrived home drunk at 5:30 a.m. on the night he ordered the card and took the ID photo using the Snapchat app. The rest was a blur according to the student, and he had “completely forgotten” that he created the card. That is until the card arrived in the mail. No one from The National Union of Students, or ISIC has contacted Shaw regarding the puzzling photo. He also says that despite some strange looks from cashiers when using the ID, he has no intention of paying the £12 replacement fee to receive a new card. This all comes after a similarly comical ID photo was printed to another student’s ISIC card last month. Another law student at Milton Keynes’ Open University was applying for her ISIC card and submitted a selfie of her and a cow — yes, a cow — that was taken while on a volunteer trip in Romania.